This is a short blog post about what could have happened if a malicious user had exploited the issues I found. Java applet implementation could really break the web. Java DNS Rebinding: an attacker can point a controlled host to any IP of the web. Java applet same IP Host access: an attacker can read the response of any host which points to the same IP the applet originates. Suppose now that evil.tld server hosts a page which forces a DNS Rebinding to google.com IP. Then if a user visits that page, Java VM applet sandbox will think that google.com and evil.tld share the same IP. According to Java Same IP Origin Policy it will be possible from then to read google.com pages. Extend the attack to any possible host. And you'll see the extent of the issue. Now, someone could say DNS Rebinding is difficult to implement.Yes, Could be. Considering that Xss are still one of the most widespread vulnerabilities on the web (50% of world sites? ), you'll got another picture. Finally, a malicious page could use classical History steal or other logged in detection techniques to understand if the victim is logged to some site and you got the bigger attack flow. This attack could have created a big internet (client side) mayhem. This is fortunately no more feasible because I made responsible disclosure to Oracle and waited for 6 long months before disclosing all the 7 issues. Now that Java update is out everybody is suggested to install it. Oh, and if you don't really need Java I suggest you to uninstall it definitely...and that is the saddest thing. Due to a design issue on the way Java considers Same Origin Policy, it is possible for an attacker controlling a host with the same IP of the victim host, to forge requests to victim host on behalf of a user and read the content of the response. It is known for ever that Java SOP is correlated with the IP of the applet hosting server. That means that differently from other SOP, Java does not take in consideration HostNames but only IPs. This is what is called a design issue, probably originating from the '90s when the Internet was a more similar to a LAN :). By taking advantage of this design issue, if an attacker can control at least one host on a virtual server pool (uploading an applet), it will be possible for the attacker to use an applet against a legit user and read every information from the other domains on the same IP. Specifically, it is possible to forge requests and read HTML response from any other server with the same IP of the host without any further security check. So let's consider that is possible for an attacker to upload a jar on a virtual host (I.e. an uploading host uploads.vhost.tld or a fully controlled host) which will results in an applet downloadable from the server. What happens is that when Java makes a HttpURLConnection it asks for Cookies to the browser which provides them back to Java except for HttpOnly cookies (this is a publicly known behavior). After that, even if it seems that is not possible to directly read the cookies from Java, it's still possible to read the html content since there is IP sharing. Yeah, using TRACE is still possible on non HttpOnly cookies but that method could be disabled on the server side. This will result in some sort of CSRF (you cannot read cookies) but with read access to the response, allowing the attacker to read for example AntiCSRF tokens and other sensitive data. The following screenshot is the result of an attack from a malicious user (evil me) to google.com getting information of a logged in user (angel me). Another interesting attack: Host header. The latter, in conjunction to the same IP SOP will create a way to steal cookies as well. 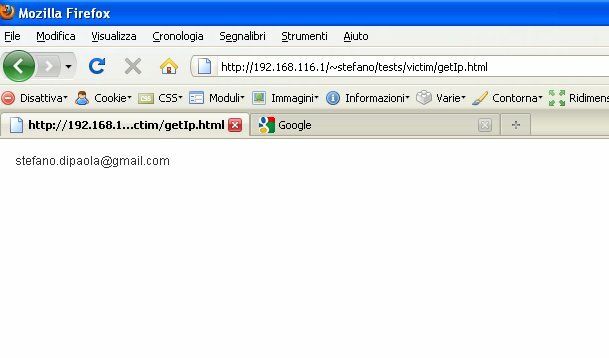 Suppose www.attacker.com is on same IP of www.legit.com and a user is logged in on legit.com site. A malicious user could then try to let the user to go to a page with the following content. What happens here is that Java asks the browser for www.legit.com cookies and then sends the request to the server which sees the Host header and sends it to the attacker's site stealing the (non HttpOnly cookies). Moreover it will be possible to add or overwrite cookies from an attacker page by simply setting a cookie in the response header. That cookie will be passed to the browser which thinks it's a cookie belonging to legit.com. It seems that Roberto Suggi Liverani found the first part of the design vulnerability as well on August and responsibly disclosed to Oracle. It also seems that Oracle were so obscure to not telling him that the issue was already found and reported by me. So you'll find another similiar advisory on the net. 30th March 2010: Issue found. I think that since it's a design issue probably Oracle will have some objection in fixing it. So I decide to send an attack example to Google. 1st April 2010: Google says it has to be corrected by Oracle. They can help pushing for a fix. 6th May 2010: Oracle Confirms the issue. 6 Apr - 12 Oct 2010: Some Oracle updates and finally the Java release. In 2007 it was discovered that Java Applets, in conjunction with LiveConnect plugin on Firefox, were vulnerable to DNS Rebinding and take advantage of Java features like TCP and UDP socket connections on unauthorized sites. But the only browser which resulted vulnerable was Firefox. During an assessment of Java VM source code (v. 6 update 21) it was found that the attack was still feasible, probably due to a regression issue and, more important, I found a way to extend the attack to every browser. A fix should have been implemented in the new Java 6 update 22. An interesting new feature which was added in Java 6 is that after the instantiation of JVM from an applet tag the Packages objects are now accessible from any browser. So a similar trick used by Anvil can be used with some variant. Java implements at least two security domains. The first one is the classical sandbox restricted to the domain were the applet originates. The new attack tries to force the generation of Js to Java objects cross browsers. Under Firefox the attack is identical to the one by Kanatoko Anvil. Connect to 127.0.0.1 and do port scan with read/write access. So the trick is to set up two Applets the first one pointing to evil.tld which is the same hosting the html page then the second applet points to another attacker controlled host which will be used to rewrite the Js to Java Objects and, hence, bypass the DNS cache. After that it'll be possible to perform classical DNS rebinding attacks. One of the first thing that made me research Applet security was the presence of java.net.ServerSocket package in applets. This package allows to open a socket server listening to incoming connections. The previous code is accepted by applets and is legit as of the time of writing. The restriction comes out when accept method is called. Infact due to Same IP origin Policy a crossdomain.xml will be required to 127.0.0.1, and if not found an exception will be triggered. Here the DNS Rebinding comes in handy. By applying the technique previously described it will be possible to set up a SocketServer listening to 127.0.0.1 accepting connection without triggering an exception. Now someone could ask: "Ok but what can I do with a server listening on localhost?". Crash some local server and then sniff connection on the same port (difficult but feasible). Find some host that resolve to 127.0.0.1 and get/set domain cookies. Let's talk about the latter. I downloaded the list of top 500 Alexa sites and found 20% (thumb rule) of them have some site that resolve to 127.0.0.1. N.B. : Don't try the poc from wisec.it since it has not a DNS server controlled by me. So it won't work. Due to the Same IP Origin policy of Java Applets it is potentially possible to attack every single host on the Web. I'll write about it in the next few days. inject new requests by abusing the request header Transfer-Encoding. The result is a well known attack called Http Request Splitting . gather information about the existence of a Http Proxy. Applets sandbox allow requests to be performed to the host where they originate by using the class java.net.URL. This is allowed according to Java SOP. Also it can be abused to get forward proxy information such as proxy password. The first two issue on Java Applets are related to Information disclosure. In particular a malicious user could get important information about private IP of each NIC a victim has on her platform. It is possible to infer network IP on any local NIC via HASHCODE. It is known since Java v1.4 that Applets expose some network information of a user machine. which does work according to SOP (Example here). Since Java 6 several other methods have been added which disclose Nic names, MAC and other information. There is however some limitation on the information that can be gathered, and in particular it's not possible to get the IPs because they are tied to Same Origin Policy; for example is not possible to get the IP of VPN local interface. We found that it is possible to bypass SOP by reversing the Hashcode of NetworkInterface object. But, what happens if there are more IPs bound to a single NIC? And then use it to get the IPv4. It is possible to get the DNS address of a victim. The SOP mechanism on new Java 6 applets is similar to Flash. Before doing any action it check for the existance of crossdomain.xml files. setting the DNS to "dns://" Java VM will get the default DNS and ask it for crossdomain.xml file with a HTTP request on port 80. If DNS drops packets on port 80 then Java will wait until socket will timeout, otherwise will return immediately with an error. The error contains the DNS IP. The attacker can easily get the DNS IP from the error and use it for further attacks (DNS Cache Poisoning and so on). If windows supports IPV6 and there are IPv4 + IPv6 IPs on a single interface it is not possible to infer them since Hashcode cannot be reversed. You'll need to wait for socket timeout to have your DNS IP discovered so be patient. To be noted that MAC address revelation is a feature. After several months since I contacted Oracle informing them about ten issues on Java applet security, they will release an important update of Java today. It fixes several security issues, seven of which were found by me in May. There will be some post on this blog describing the issues and an impact analysis. 12 Oct 2010: Java update 22 released which fixes 7 out of 10 issues. 11-20 Oct 2010: Minded Security Advisories publicly disclosed. I have had many questions regarding Padbusterdotnet after our previous post Investigating .NET Padding Oracle Exploitation. Here I'll try to answer some of them. How can I download the Web.config? Since Microsoft patches are already out now I will disclose how to download the files remotely. Padbuster v0.2 and Pudbusterdotnet cannot alone download the Web.config. For achieving this result I have made a Poc that you can find here. Update 04/10/10: A couple of days after the release of our initial exploit Brian Holyfield added these (and more features) in Padbuster v0.3. Now Padbuster is a swiss army knife to fully exploit .NET Ajax handlers. Note: first bytes magic values are "r#","R#","q#","Q#". Therefore you should use Padbusterdotnet to encrypt the string "|||~/Web.config" and bruteforce the values of a test block that will be added at the beginning of the encrypted data . Since the S-Box of Triple Des and AES give a total different block for each byte that changes on the first block, we can simply substitute random bytes in the first block. This is quite reliable, but it takes some thousand requests to be successful. Do I really need a Padding Oracle for breaking .NET encryption? The answer here is NO. In unpatched framework 3.5 Sp1 (and maybe above) "ScriptResource.axd" is flawed. If you send the "T" magic value as the first letter of the first block after decryption, it will decrypt the whole "d" parameter. You do not need Padding Oracle at all. In addition since it's a pure fast bruteforce attack, you do not need to check for 404 vs 500 errors: you just need to check for 200 status codes. As you can see to decrypt any string encoded with the MachineKey you just need to bruteforce the first block (this is very fast because you need to guess only 1 letter). If you prepend this block, you can instantly decrypt any string, so you don't need Padding Oracle Anymore. P.s. since you also see the plaintext from your encrypted block, you could be able to encrypt arbitrary values.